(CNN) - With the presidential campaign ended, Rep. Paul Ryan is back in Washington and happy to trade the title "Republican vice presidential candidate" for the role of "wonk." 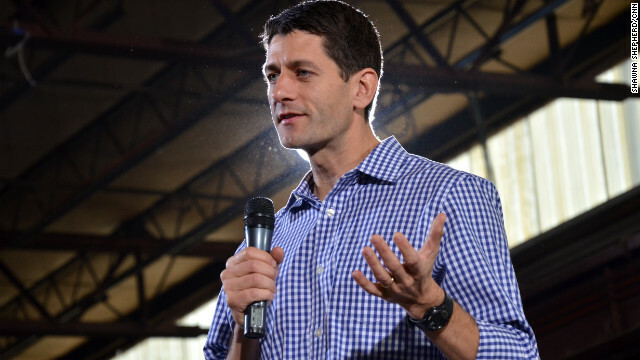 That's how House Speaker John Boehner recently described the House Budget Committee chairman, and in an interview on Tuesday, Ryan said he thinks it "a great compliment." "I've always been one of the House policy wonks," Ryan said in an interview with ABC News. In a previous, post-election interview, also with ABC News, Boehner said he didn't see Ryan stepping off of the GOP presidential ticket and becoming the party's de facto leader. "Paul Ryan's a policy wonk," said Boehner, the nation's top-ranking elected Republican who added that Ryan could be viewed as a significant Republican Party leader. "He's involved in the cause of trying to bring us pro-growth economic agendas for America and making sure that we're doing this in a fiscally responsible way," Boehner said. For his part, Ryan said he doesn't see any one individual as head of the party. "I don't think that we have one person who's a leader," Ryan said. "We shouldn't have just one person that's a leader of the Republican Party. It's decentralized. We have a lot of great talent in this party. We have a lot of talented people that are gonna be offering their ideas." The Wisconsin Republican will presumably have his hands full, as lawmakers look for a solution to the approaching so-called fiscal cliff, a collection of tax increases and spending cuts due to take effect in the new year barring a congressional compromise to stave it off. Economists predict a plunge off of the fiscal cliff would plunge the U.S. economy back into recession. As to his possible future as the leader of the Republican Party, Ryan offered the same answer on Tuesday as he had earlier in interviews with local Wisconsin newspapers: a hypothetical 2016 presidential run would be years away. "Aren't you tired of presidential politics? I know I am," he said. "Let's just deal with one thing at a time. I've got to think people are a little sick of hearing about presidential speculation after we just finished this presidential campaign." Really?! How about "Loser" and "Liar"?? Unfortunately, "wonk" implies a high level of knowledge. In Ryan's case, the correct term is "poser". It must be where you live or just who you are because in my neighborhood......you DON'T want to be called a "WONK"......In this case however it really fits and it is NOT a compliment!!!! The GOP has realized that the bulk of the VOTING population no longer accepts their pronouncements at "face" value. They will have to prove their "bumpersticker-isms" going forward. This will be good for America but bad for conservative, right wing, religious zealot, neo-conservatives. "Trust me" didn`t work for Romney even though the self proclaimed wonky Ryan tried to dodge explaining the numbers while on Fox News. So tell me GOP politicians, why is it that tax cuts for "job creators" failed over the last 12 years? Guess it the next best thing for you Paul, given you previous title of "brown noser"
Do this people know what "wonk" means? or just fooling their base, because this guy’s math cannot add up? He constantly lies at it was evident during his recent campaigning. A liar cannot be intellectual because intellect needs honesty more than anything else. I saw Paul Ryan's interview on ABC and the guy just doesn't get it. We have heard his ideas and they have been rejected. Heck, he couldn't even win his hometown. Looks like Ryan is a pretty sore loser and is still set on being an obstructionist. He should consider that President Obama has two things that he'll never have.......a mandate and integrity. Tired of presidential politics? At this point, the thirsty sidekick is just glad he was able to get his old GOVERNMENT job back. One thing is for sure, Ryan wont' run again for at least eight years, because he learned real fast that he wasn't ready for prime time nor the scrutiny that comes with it. After spending countless hours with Willard, and enduring one failed interview after another (in which he looked totally unprepared and totally like a teenage boy guilty of something), I think it's safe to say Paul Ayn Ryan has no regrets he didn't land the No. 2 spot. He is still a liar. He may be a wonk, but it doesn't mean that he is correct. I don't think that Boehner is really correct that his policies are pro-growth. There aren't any policies that are pro-growth as far as I see. There are policies that can hinder some kinds of businesses, but if someone can build a business, they are going to no matter the rules. The guy couldn't even get specific about his own policies. He's no wonk, he's an intellectual lightweight and puppet for the GOP establishment. I would argue that the title "Economics Imposter" fits Paul Ryan better than wonk. How about "useless prop that couldn't even deliver his home state"? Is that a compliment too?? OMG! It says Ryan in the headline! Cue the lefty spews. How long before there's an article on Palin? We are not tired of Presidential politics, we are tired of you and your fellow losers lying and trying to steal the WH!! Why anyone cares what you think after all the crap you put out the last couple of months, is beyond me and the VP job is beyond you!!! Go home, hang out with some folks that believe you are a good human being. Get some new prospective on what is RIGHT and what is wrong and then maybe try again(who knows, maybe not!). In any case, now is not the time for you to be in the headlines about ANYTHING!!!! We are hearing more from this inbecile than we did during the race to the White House. Can somebody pleae take that microphone from him and put it where the sun don't shine and tell him to shut up!! BTW – YOU ARE NOT A LEADER!!! Now that you don't have murdouck and your twin akin to pal around with you are toast.